I was an 8th grader at Chestnut Grove Middle School in the booming metropolis of King, North Carolina. I got on AOL Instant Messenger. You see, the Stokes County Fair was in town. You may think of the fair and think of an awesome place to be with outdated concerts and awesome food. I think of the fair and think of rickety old rides set up in the outfield of the American Legion baseball field. The Stokes County Fair was about as redneck as redneck gets. But in 8th grade, things changed. Our parents stopped having to follow us around at the fair and they would drop us off and come back in a few hours. It was our first taste of freedom. My original answer to her question was no. I didn’t want to go to the fair. She told me she thought I should go and I told her I’d rather stay home. Not taking the hint, she kept telling me I should go. Eventually I asked her why. In typical middle school dude fashion, I didn’t fully understand what the winky face meant. I kept saying no until she finally spelled it out pretty clearly and said she liked me. Then it hit me: she had a boyfriend. Wait, I’m on the football team. That didn’t stop me from going. When I got there it was the nervous, “Hey. What’s up? Cool. Yeah, I’ll buy you a funnel cake.” I made that last part up. But I wish it was true. Sharing a funnel cake would’ve been less embarrassing. While the sun was still up, we hung out with a group of friends going on the different rides. As the night went on, the worry of the boyfriend started to go away and my confidence started picking up. This was a sure thing, right? If it would’ve stopped there I would’ve been good. As we got on the ferris wheel, my palms got sweaty and I got scared. Eventually, I did it. I tickled her again. And this time, as she looked at me, I went in for it: boom. 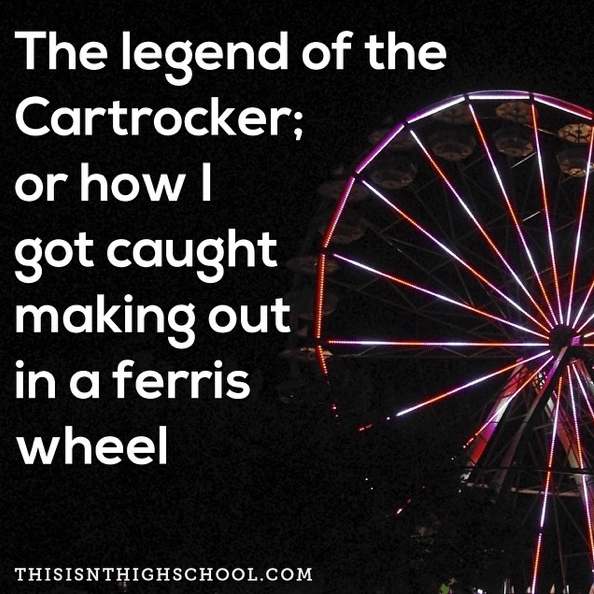 Making out on the ferris wheel. I felt like a king. I was the cool guy from the movies. I was awesome. Then, from below, I heard my friends. All yelling. All making jokes. In front of everyone. The next Monday morning I came into school and had a new nickname: Cartrocker. They joked that the cart was rocking while we were making out. Not only did they call me Cartrocker that day, but they called me Cartrocker the rest of that school year. I had 27 different people write something about the Cartrocker in my yearbook that year. And so goes the Legend of the Cartrocker. That’s only one of quite a few embarrassing stories from middle school. Do you have any? Let us know in the comments! The gym shorts thing is pretty amazing. Oh, that’s nothin, I got my braces stuck in the CARPET! On the FLOOR.